Like Father, Like Son: By working in BookShop Santa Cruz and serving on the city council, Ryan Coonerty is following in the footsteps of his dad, Neal. Will he one day be mayor like Neal was in 1994? Feeling the heat for his support of the derailed Coast Hotel project, councilmember Ryan Coonerty talks about his hopes and concerns about our community--and his own political future. A week after the 2004 election, Metro Santa Cruz profiled Tony Madrigal, one of two new faces on the incoming City Council--the one who wasn't supposed to win. Five months and one doomed hotel project later, we turn our attention to Madrigal's fellow newcomer on the council, native son Ryan Coonerty, who along with Madrigal voted in January in favor of the failed Coast Hotel proposal. Last November, Coonerty was riding high on the wake of an election, in which he won the second most City Council votes in the history of Santa Cruz--a feat further amplified by the fact that he did not have the power of incumbency on his side. Coonerty credits his record-making entry onto the local elected scene in part to having grown up here, in part to his self-claimed ability to "talk to and understand the concerns of both the progressive and business community here." That ability, says Coonerty, came from growing up in a highly politicized family, who also happen to own a local business. 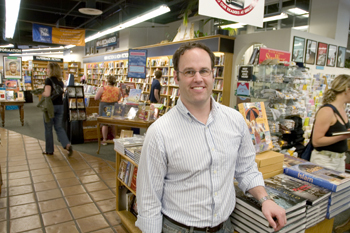 Coonerty's father, Neal, has owned Bookshop Santa Cruz for more than 30 years--the exact number of years that Ryan has been on planet Earth--and served for four years on the council (1990-94), including a year as mayor in 1994. Coonerty Jr. also appears to have been preparing for a life in politics with the educational path he's pursued. Having left Santa Cruz to secure an undergraduate degree in history at University of Oregon, a master's in international relations from the London School of Economics and a law degree from the University of Virginia, Coonerty then spent a couple of years in D.C., working on election reform from 2001-2003 for former Presidents Ford and Carter as part of the National Commission for Federal Election Reform. He also worked on balancing national security and civil liberties in the wake of 9/11 with the onerously titled Markle Foundation Task Force on National Security in the Information Age. But a few years ago, Coonerty had an epiphany that led him to conclude that, as "a good Democrat," he wasn't going to be able to do anything in D.C. That realized, he returned to his hometown, where he works as vice president of Bookshop Santa Cruz and as a lecturer in legal studies up at UCSC, in between fulfilling his duties as a fledgling member of the City Council. But in spite of his family pedigree and his flying political start, Coonerty recently became embroiled in an ugly community battle over the Coast Hotel project. A week after that project was declared dead in the water, Metro Santa Cruz caught up with Coonerty to talk about lessons learned and his hopes for our community--and his own political future. METRO SANTA CRUZ: What are your earliest political memories? RYAN COONERTY: There's always been a ton of politics in my family. It was just what they talked about. Early on while I was in high school, I rebelled--by talking about the virtues of suburbia. But I was probably still a good Democrat by national standards. And the same month I was editor of the Santa Cruz High newspaper and put a condom between the pages of every edition, Magic Johnson said he had AIDS, so the high school story went national. At the same time, my dad was on the council, passing anti-discrimination legislation, which would primarily protect gays and lesbians. So we had people leaving Bibles on our lawn, and Rush Limbaugh attacked my father on the national airwaves. Suddenly I went from being a disinterested football player to being a political activist. 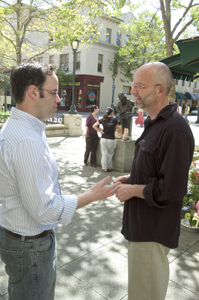 What made you want to run for Santa Cruz City Council? Didn't you know better? My father keeps asking me the same question. (Laughs). The truth is I'd worked in Washington on a national level, and now wanted to be at a grassroots level, working for the town I care about. Remind me. How many votes did you get in the 2004 election? About 16,000. The second most in the history of local City Council elections. Who or what do you think won the race for you? A combination of factors. Part of it is having grown up here, so I have a lot of connections in the community. Also, I think I could effectively talk to both the progressive and business community and understand their concerns. Who do you feel you currently represent within the city? I still feel I represent both these constituencies. For instance, I voted for the Coast Hotel project, but I also worked to prevent Home Depot from coming to the Westside. I don't think those two positions are in conflict. Both are in the best interests of the community. I've heard the term "pragmatic progressive" being bandied about. What do you think it means? Does it describe you? I'm not sure what it means and I'm not all that interested in it. I think the progressives have a responsibility to make sure we have a sustainable community. For me, that means having a sustainable environment, a sustainable economy and good neighborhoods. I don't know what that makes me, but I'm still pursuing things issue by issue. I think government works best that way. What are your bottom-line core values? A deep love of this community. I believe you need to maintain some of the things that make this community special and sustainable. We can't be a bedroom community for San Jose. People have to be able to live, work and shop here. Anything else different from that isn't the town I grew up in, nor is it the town I want my kids to grow up in. At the City Council we focus on the budget, which is important, but I believe we have a broken economy. We've lost thousands of decent-paying blue-collar jobs. And with the dotcom bomb, we lost thousands of good-paying tech jobs. We have less business and tourism downtown. What that means to me is that people aren't being paid enough to live here. The cultural and diversity aspects of the community are fundamentally threatened. We need to find solutions, if not through the Coast Hotel, then through something else. How have your first five months on the City Council been? Incredibly intense. Fun and good, but intense. I think coming onto the City Council, the learning curve is really steep, but because of the Coast Hotel it's been unbelievable. Did you expect it be this confrontational? Overall the tone of politics in Santa Cruz is better than it has been in a long time. People are talking civilly to each other on controversial topics like the Coast Hotel, in a way they weren't when my dad was on the council from 1990-1994. Do you now wish you'd agreed to a six-week delay on the Coast Hotel project? Looking back on it, it's difficult. It would have been better to have an additional six weeks of a community conversation. The problem was at the time I don't know if that would have made the project any better, and the project's parameters had already been set. By not taking six weeks, people seemed angry with us. I don't know if we'd had six more weeks, if people would have been any happier. It's likely there still would have been a 4­3 vote. At the time, it felt dishonest to spend another six weeks and not have anything change. How do you feel about the council's 4­3 vote and the ensuing petition drive? I think the way the council approached the vote, listened to the public and put over 100 conditions on the project, and the signature gathering that followed--all were an elegant display of democracy. The petitioners did a really good job. That said, it was frustrating because I would be stopped on the street and blatant misinformation was being given to me when I was asked to sign the petitions. Political Mentors: Ryan Coonerty isn't afraid to ask the advice of former assemblymember Fred Keeley, pictured here in front of the statue of another great political mentor--musical saw player Tom Scribner. For instance, that the petition was about the protection of open space, and that the proposed parking structure was a six-story garage, when in fact it was four-story. I think the petitioners would have got the signatures they needed simply by talking about the real concerns. That was unfortunate. But they went door to door, and stood in the rain. That was real. So, I got the message about the level of discomfort about this project. At one point in the Coast Hotel discussion, you said you'd be prepared to put the issue to a vote in August. Wouldn't that have disenfranchised the student vote? Initially, I was open to scheduling a special election whenever it worked best for the city. But after talking to people in the community I made the decision that I would not support it in August. I felt it was wrong. I campaigned hard on campus, I teach on campus. Engaging in that community is important. So, just before the Coast Hotel, people made the decision not to go forward; I made the decision to support an election that would have coincided with Arnie's special election in November. The Coast Hotel and Gov. Schwarzenegger's initiatives on the same ballot, then? It probably would have had a good turnout. What about the poll conducted to test the waters over a Coast Hotel special election? I've never seen it. I knew it was happening. It happened very quickly. I thought it was a good thing to do, because I didn't think we needed a divisive fight in the community. And from the results I've heard more people than not were willing to support the project. That says a lot when you're talking about development on the Westside on the coast. But I think it would have been a really hard fight and it looked very difficult on the Coastal Commission side. You could end up winning the battle and losing the war. What was your involvement with the Coast Hotel developers? I spent many hours in negotiation with the hotel. I got some impressive concessions, including a 7.5 percent reduction in size, which is the equivalent of a floor and half off their biggest building. And they were going to buy all their art from Santa Cruz artists. I also spent a lot of time in Clearview Court Mobile Home Park, trying to improve their situation. We were on track to do it, when the hotel pulled out. When it was clear that the project, as voted on, was dead politically, were you still hoping for a solution that would somehow salvage the hotel/conference center idea? Yes, until today, I'm still looking for some compromise that can answer some of the concerns of the community and still work economically for the hotel. I don't know if the emotions on both sides make that impossible. But it's a real shame if they only renovate and paint the hotel. The city will have lost an incredible opportunity. But the only way that would happen is if we start the whole public process again. Only this time, we must do a better job of hearing and dealing with the public's concerns, instead of coming up with a project on our own that won't fly. This project went to the council before I got onto it, a council that voted unanimously to push the project forward. When I got on the council a lot of pressure was coming from the hotel owners to push the project through faster, because of financing issues. They wanted us to vote, I think, within two weeks of my coming onto the council. I didn't think that was adequate. I told the city staff and developers flat out that I couldn't vote on it right then. When the owners of the Coast Hotel pulled the project off the table, you said, "We could have won the referendum election though it would have been close." Who did you mean by "we"? Isn't the council supposed to be an approval agency, not an advocacy group? When I said 'we' it was because the owners had pulled out, so there were no more City Council actions ahead, just purely political machinations, and I was speaking as a proponent of the project. It's been claimed that those appointed to the city's General Plan Advisory Committee are all proponents of the coast Hotel. Do you think this perceived stacking of the deck undermines the credibility of the process? No. The City Council did not pick and choose who was on the committee. We had very little control over who was chosen, and the members represent a wide variety of interests. I've heard people say, "Ryan's burned a lot of bridges over the Coast Hotel." I hope that's not the case. I guess I'll get to know when I want to run for reelection. (Half laughs). There are two ways to be in political life. The first is to start with your home base and go from there. In some way, that's really easy. You always have people telling you you're great and doing the right thing. The second way is to go issue by issue and work with everyone. That leaves you without a base and is a little lonely, but I think that's what real leadership is. Mayor Mike Rotkin tells me that you and Tony Madrigal have received far more heat and attention than him and Cynthia Mathews even though all four of you voted in favor of the project. I think that has in part to do with the fact that Tony and I are young. And having grown up here, people knew me when I was a kid and so they want to educate me. The other part is I got broad support across the political spectrum. A lot of them felt that they backed me and so I should listen to them. So, from half of them I heard that I was doing the right thing, and from the other half, that I was completely wrong. My guess is that on the next issues, of UCSC growth, of Home Depot, those groups will be reversed. I don't know what to do other than to be just who I am. You have been quoted as saying you felt influenced by Mardi Wormhoudt to oppose the project before being sworn in in November. How big an influence does Wormhoudt wield? Do you feel that it's tantamount to "backroom deal making" as alleged in the Sentinel last week? The flap about Wormhoudt's opposition to the Coast Hotel looks like the opening salvo to the 2006 county supe race. Do you have any aspirations in that direction? I wouldn't run against Mardi. She's a friend and it's hers to run for. Right now I'm working so hard just to do my job for the community on the City Council, I haven't had a chance to think about anything else. I can barely shelve the books at Bookshop each week, much less plan out a political future. Do you think you are more conservative than some of the older City Council members? I think I have a fundamentally different outlook on the role of government, on important battles that need to be fought. A lot of people came of age in a time of direct conflict and the issues they were fighting were huge. Protecting the North Coast. Lighthouse Field. I believe we're in a different era. It's time to make the table a little bigger, to maybe not have big fights but instead look at a number of targeted policies. I don't see symbolic battles happening. I see it more about making sure the city operates within a set of core values in a way that brings more people into the process. With the Coast Hotel dead, what steps can the city take in terms of revenue-enhancing and money-saving projects? The city is facing a $700,000 budget shortfall, which is the equivalent of 15 city workers' jobs. The problem with touching pensions is that without them the city would no longer be competitive in terms of retaining police. So, where are we gonna get more revenues? I've run a lot of tax campaigns, to protect city funds, to save schools, but I don't know if we can keep on taxing people without growing our economic base. What obstacles do you see in the way of trying to solve the city's financial crisis? One thing that worries me across the political spectrum is that there's a perceived 'They' out there that has to be beaten. It's too small a town to have these distinctions and see enemies around every corner. It doesn't make for sound policy and doesn't help the way our community converses with each other. These sort of divisions have to end. The problems we have now can't be solved by any one of these groups. I don't know if I'm the one to overcome this, or whether I'll end up being thrown into one political camp or another against my will, but I'm hoping, on an issue by issue basis, to work with whoever works with me. It's lonely being in the middle--the middle here being a liberal Democrat in every other part of the country. It's not as if I'm trying to keep one foot on the Republican party, but it means a different way of thinking about politics and it may mean I'm not meant to be an elected official beyond one term. If so, so be it, because I'm not going to change. I plan on working with Mardi Wormhoudt against UCSC growth and for human services. And I plan on working with the business community on downtown and beach area issues. People need to be ready to compromise, as they were after the earthquake. Then they had government subsidies and a crisis to focus people's minds. Now we don't have the government subsidies, but we do have a crisis. It's been said that in Santa Cruz you either have to be with the business community or with the "community" community, that you can't have it both ways. It's impossible for me to think about the business community as separate from the rest of the community, because I'm part of the business community. At Bookshop, we're here to sell books and make a profit. I grew up with Gary Patton's daughter and Scott Kennedy's daughter and Bruce McPherson's son. I don't see that somehow one group here is the savior or destroyer of this community. What are your upcoming plans on the council? Simplifying musical permitting process for restaurants and cafes, so we can have more music downtown; creating a task force to address ongoing downtown issues, such as lighting, dirty sidewalks, more police; continuing to do anything and everything to stop UCSC from growing by 6,000 students, which would be devastating in a way that no other issue could be; and looking at Westside places to capture high-tech spin-offs, light manufacturing and small to medium businesses, so as to create a job base. Former state Assemblymember Fred Keeley has said that when it comes to the city vs. UCSC battle, the university holds all the cards. We have a very good advocate in [current Assemblymember] John Laird. Can we begin the process to inject some reality into UCSC planning? Can we communicate the real concerns of our community about UCSC growth to the UC administration and leadership? I don't think UCSC is looking to completely ignore everything we say. I think they're looking for some kind of compromise. I met with UCSC Chancellor Denise Denton this morning--and I sense we can work together to find an acceptable number of students and mitigate some of their impacts. A committee is looking at the related transportation issues, so I'm hoping something comes of it. I've asked specifically that UCSC move its non-academic personnel to downtown or the Westside, which would mean 300 less people driving up High Street, and less deliveries being made. It would also help the local economy to have more people eating lunch downtown, where they are closer to retail. Have the last five months cured you of your political aspirations? They have not, but they may have cured other people of my political aspirations. (Laughs). It's been fun. It's incredible to be involved at all levels, bringing people in at all levels. I still have a lot of work to do. I'm not done yet. But I wouldn't mind only having to decide whether to put up a stop sign or not for a while!